There was a smaller number of entries than usual this year, although it was again multinational, with submissions from Canada, India, Israel and the United States. Perhaps the single-dummy (declarer-play) problem was too hard. Perfect answers came from Darryl Depew, Henderson, Nev.; William Gibbs, Staunton, Va.; and Jim Ritts, Knoxville, Tenn.
Other entrants who got the play problems right but tripped up on one or more of the bidding questions were John Harvey, Mount Hope, Ontario; Richard Walker, Mansfield, Pa.; and Murray Wolf. 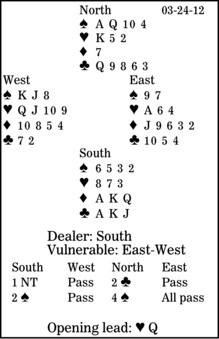 West leads the heart queen, the defenders taking three tricks in the suit, then shifting to a diamond to South's ace. How should declarer continue? He has to play trumps without loss. This requires finding West with the king-jack-doubleton or -tripleton. Declarer must lead a spade to dummy's 10. When it holds the trick, he returns to his hand with a club, plays a spade to dummy's queen (unless West tries a sneaky king, hoping South isn't watching carefully! ), cashes the spade ace, and claims.